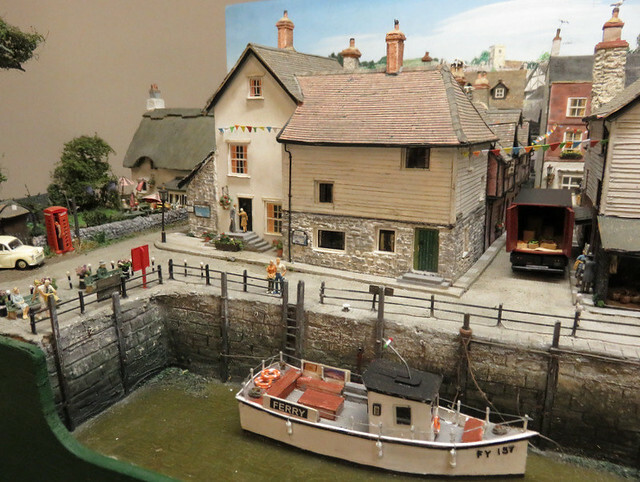 At the WRG show in Lancing last week there was a scenic modelling demonstration by (I think) Roy Hickman, on display was a superb diorama. Not just a pond, or a tree, but a whole garden! My son was (rightly) very proud, and told me that the pond is made from three layers of glass. The bottom is black (I guess that may be plastic), the next brown, then clear at the top. In between is pond weed and goldfish (scrapings of orange wire insulation). The path is egg-shell - painted, then broken and stuck down, then crushed to the crazy paving effect, with scatter to fill the gaps. These are clever tips that I'd never have thought of. What's more, when my son had finished there were a couple more kids busy building similar gardens. 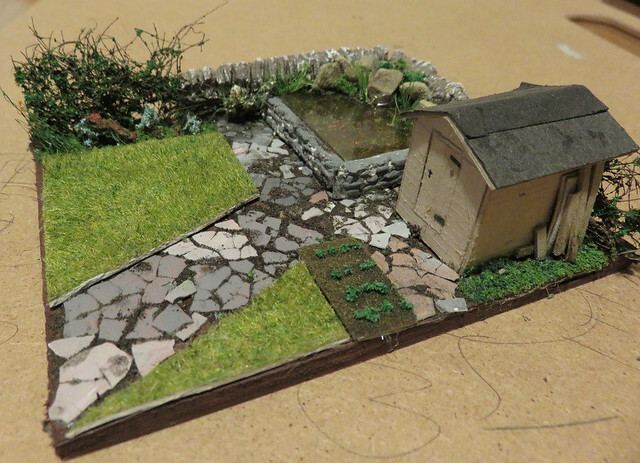 So not only has Roy got a real talent and great ideas for scenic modelling, but to have the patience and enthusiasm to teach kids - and get them interested, engaged, and doing relatively complex tasks - that's something else altogether. He didn't even charge a penny. What a great ambassador for the hobby. 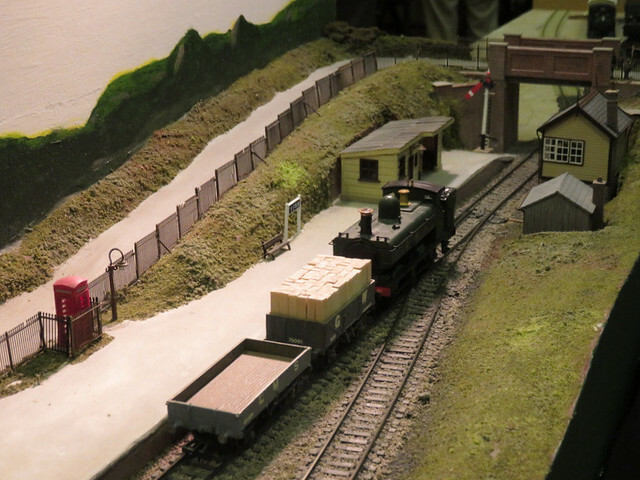 On Saturday I took Awngate along to the Wealden Railway Group exhibition, held this year at the Lancing Parish Hall. 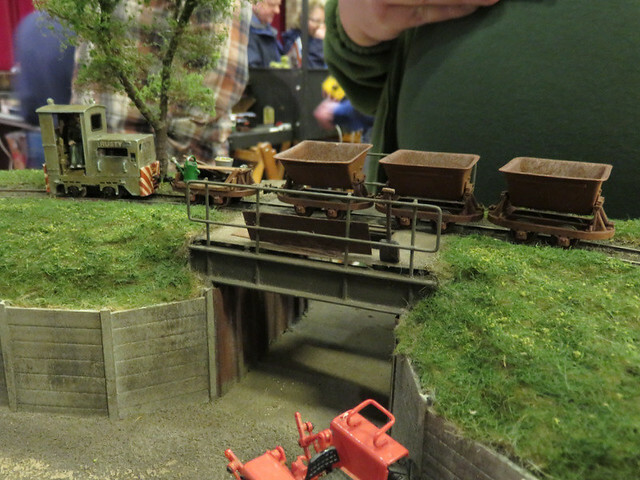 As usual it was a friendly show with a good selection of small layouts, and lots of friendly faces to talk to as well. Actually between talking and running the layout I didn't take that many photos - at least, that came out well. Still, here's a few of my highlights. 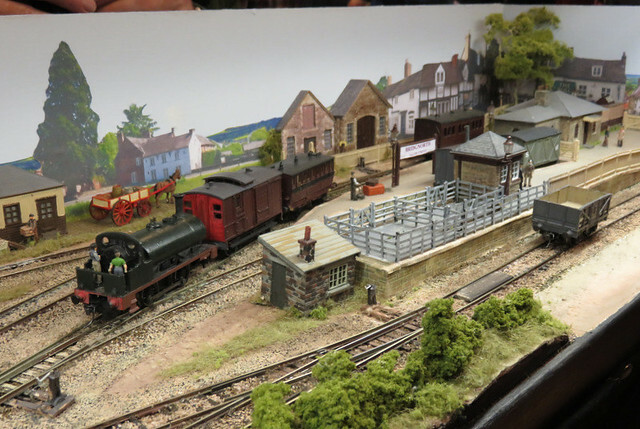 Nice to see Chris Ford's Art of Compromise, built with a few compromises but it's a refreshing change to the usual GWR branch-line, and would make the basis of an interesting home layout. Chris has managed to achieve his usual less-is-more deserted backwater feel. I think it's deliberate but maybe he just doesn't like adding figures? Anyway, it works. Giles Barnabe's Salop Street packed a lot of operational interest into a small space, with a dose of pre-grouping character, another OO layout that is very different to the typical - and I'm sure the better for it. 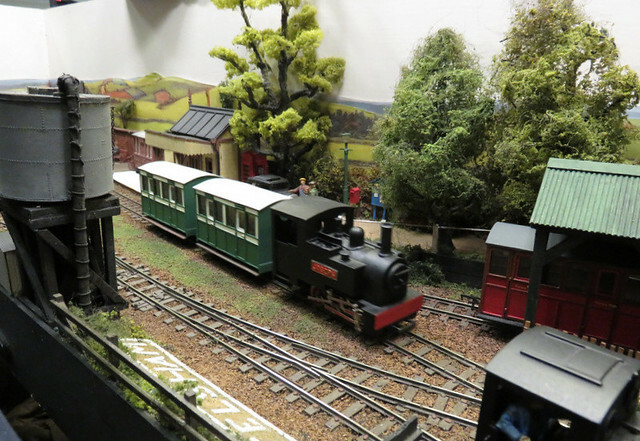 I do like Simon Hargraves' sewage works O14 layout, but then I like short trains of skips with small i/c locos. Nice textures too. The photo might have looked better if he'd remembered the backscene though! 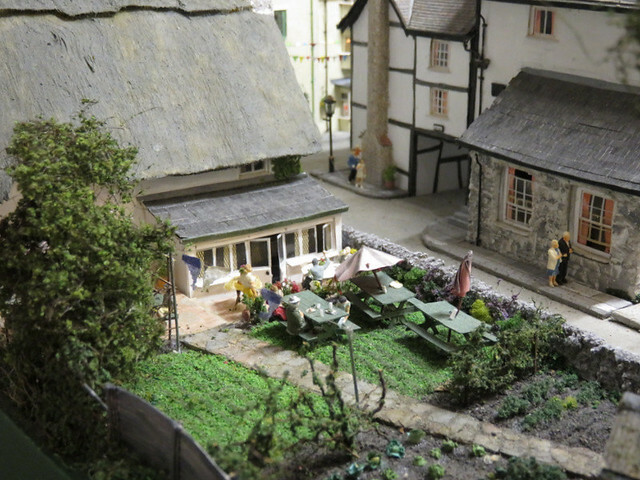 Another layout I like and haven't seen for some time is Felsham Lane by Greg Dodsworth. O-16.5 but in a surprisingly small space while fitting in plenty of interest. There are a few more photos over on Flikr, including the Loo branch (groan). As for my layout, I had to contend with a few gremlins. A couple of isolating sections didn't isolate - that is they were on whichever way the switch went. Still at least they failed on, dead track is harder to work around. Also some of the wiper contacts to the fiddle yard played up too - yes I should have cleaned them beforehand but they worked in testing! Still neither was fatal and other than some misbehaving wagon couplings the trains ran well enough. On a more positive note, one of the friendly faces took some serious photos for a potential magazine article - it's flattering to be asked, so I shall have to write something I guess! With an exhibition coming up for Awngate some preparation was needed. 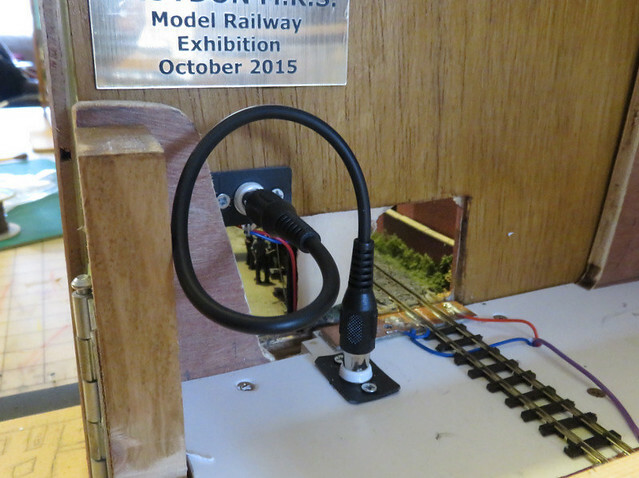 The large exhibition fiddle yard relied on brass wiper contacts to the layout, while this works fine for the small slot-on home fiddle yard they proved vulnerable and unreliable for the larger one. So I'd decided to add a wired connection. 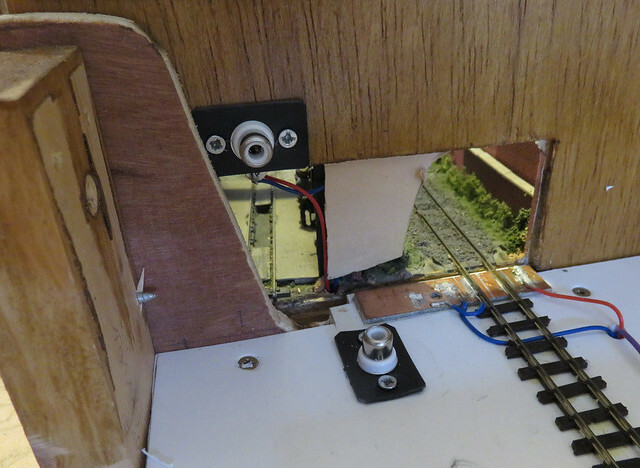 As you can see, both layout and fiddle yard had an RCA audio socket fitted, which have 2 coaxial connections and are easy to solder wires to. They screw into thin panel material so I had to mount them in some plasticard and screw that in place. The connection is then made with a short lead; the lead and sockets can be bought cheaply. My plan is to fit the same connector to Hexworthy and to Hexworthy's home fiddle yard too, to maintain fiddle yard interchangeability. The layout got a good vacuuming, to get the dust off the scenery (surprising how it builds up) and spiders off the fiddle yard (from storage in the garage). Then some extensive playing testing was endured to check everything worked. Running was surprisingly good* without cleaning the track thanks to graphite previously applied, however I've added a little more graphite to make sure. *If you don't believe me I've posted a video of a loco (with an old style N-gauge chassis) running slowly when I hadn't cleaned the track or added more graphite, or in fact run the layout properly for many months! As for the exhibition, well if you are near Lancing this Saturday drop in to the Wealden Railway Group show and say hello!